Home > 5 unique features that make our church chairs great. 5 unique features that make our church chairs great. The primary focus of our Summit Series of church chairs is to provide seamless or pew-like seating within the sanctuary. Chairs are more formal, more pew-like in appearance; while the function of portability is appreciated, it’s not the determining factor when used in this style of worship. The Summit Series of chairs allow seats and backs of adjoining chairs to touch, providing pew-like seating for your sanctuary. Even guests seated across the seam of 2 chairs will experience unsurpassed comfort. A typical layout configuration consists of an armed chair inserted every third chair (the inserted armed chairs remain interlocked with the armless chairs). These chairs also adapt to accommodate the needs of seniors or elderly who often experience difficulty getting in and out of worship chairs. With, 4 customizable back options (standard, cutaway, crown, and notched), we have a chair style to match your worship style. Speaking of chair backs, our chairs are a popular choice for permanent sanctuaries looking for a finished look from all views. 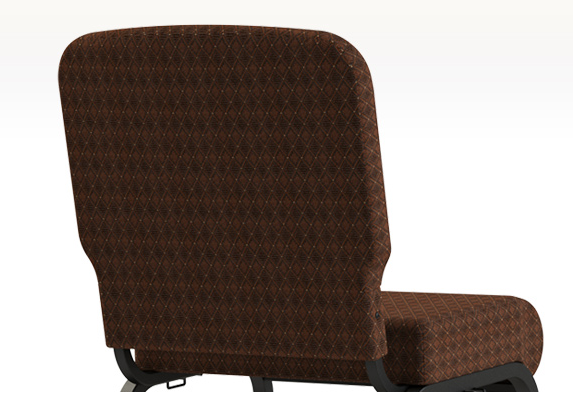 With an enclosed back chair, the upholstery completely encloses the back, and no frame is visible, even from the rear. This leaves your rows with a polished, consistent flow. An attachable kneeler has been designed to mount on to each of the Summit Series of chairs. The attachable arm allows the kneeler pad to extend 13″ behind the chair to which it is attached. The added clearance and retractable feature provide comfort and ease of operation for all worshippers. Contact us today to see which Summit chair works best for your place of worship.